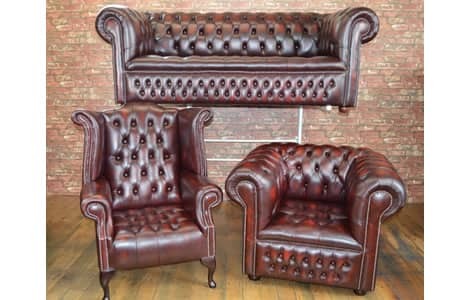 Here we have on sale The Churchill Chesterfield Range 3 Piece Suite. Consisting of a 3 Seat Sofa, a Club Chair and a Queen Anne Chair. Finished in Traditional Antique Ox Blood leather. Ready for dispatch at the earliest opportunity. The elegant Churchill Range is manufactured to the highest standard using only the finest materials. This suite is made with the buttoned seat as opposed to the traditional cushions, making it a very comfortable Chesterfield. Made from only the finest materials, Churchill Chesterfield Range is very popular with our European and UK customers alike.